In this post, we will look at what is skin effect, its causes and the factors affecting it. In short, current flow over the surface of the conductor is called skin effect. The reason behind this is explained in the remaining section of this post. When dealing with low current dc hobby projects, wires and cables are straightforward they act as simple conductors with essentially zero resistance. However, when you replace dc currents with very high-frequency ac currents, weird things begin to take place within wires. As you will see, these “weird things” will not allow you to treat wires as perfect conductors. Skin effect is one among them. First, let’s take a look at what is going on in a wire when a dc current is flowing through it. 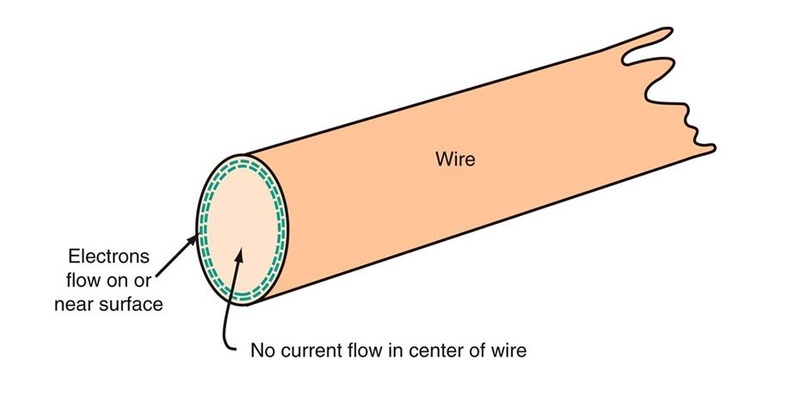 A wire that is connected to a dc source will cause electrons to flow through the wire in a manner similar to the way water flows through a pipe. This means that the path of anyone electron essentially can be anywhere within the volume of the wire (e.g., center, middle radius, surface). Now, let’s take a look at what happens when a high- frequency ac current is sent through a wire. An ac voltage applied across a wire will cause electrons to vibrate back and forth. In the vibrating process, the electrons will generate magnetic fields. By applying some physical principles (finding the forces on every electron that result from summing up the individual magnetic forces produced by each electron), you find that electrons are pushed toward the surface of the wire. As the frequency of the applied signal increases, the electrons are pushed further away from the center and toward the surface. In the process, the center region of the wire becomes devoid of conducting electrons. The movement of electrons toward the surface of a wire under high-frequency conditions is called the skin effect. At low frequencies, it does not have a large effect on the conductivity (or resistance) of the wire. However, as the frequency increases, the resistance of the wire may become an influential factor. One thing that can be done to reduce the resistance caused by skin effects is to use stranded wire the combined surface area of all the individual wires within the conductor is greater than the surface area for a solid core wire of the same diameter. In short, current flow over the surface of the conductor is called SKIN EFFECT. because it increases the conductor resistance. A solid conductor assumed to be consisting of a large number of strands each carrying a small part of the current. The inductance of each part of the strand varies depending on its position. Thus strands near the center are surrounded by a greater magnetic flux having large inductance than at the surface. The high reactance of linear strands causes the AC current to flow near the surface of the conductor. The effective area of the cross-section of the conductor is reduced due to this skin effect. The frequencies more than 50Hz. When the diameter of the conducting wire increased the skin effect will increase drastically. The effect is negligible when the diameter of the wire is less than 1cm. The skin effect is directly proportional to the supply frequency ( ie, increases with the frequency). It is negligible when the frequency is less than 50Hz. To minimize the skin effect, the shape of the wire should be less for a stranded conductor than that of a solid conductor. To reduce the it, stranded conductors are used in transmission and distribution lines. 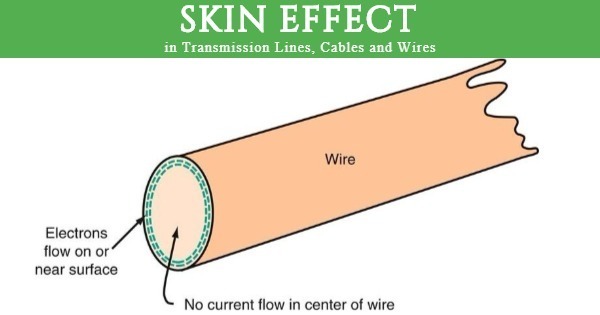 This is another factor that affects skin effect in transmission lines.